In order to enable and empower persons with developmental disability to live as independently and as fully as possible, health services and their access to persons with developmental disabilities assume a very significant role. In this context, the health insurance facility becomes important but presently such products are not easily available for persons with developmental disabilities. 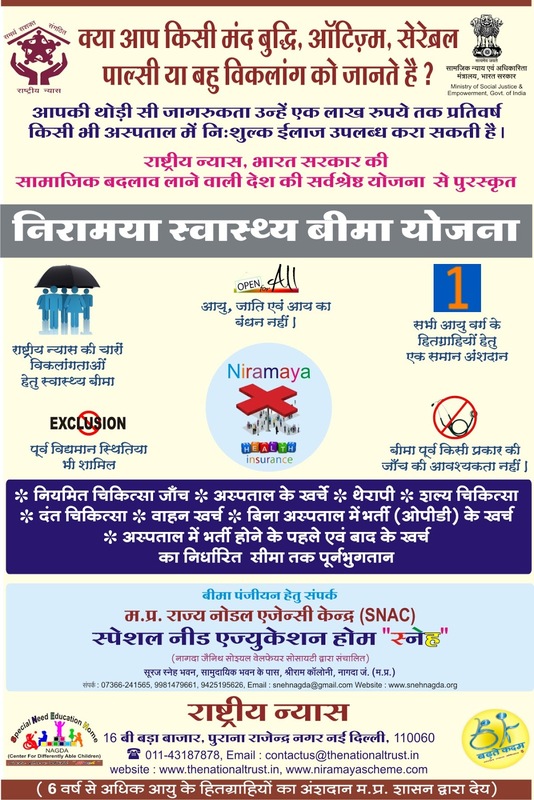 In such a situation, a health insurance scheme "Niramaya" is conceived with the following objectives. 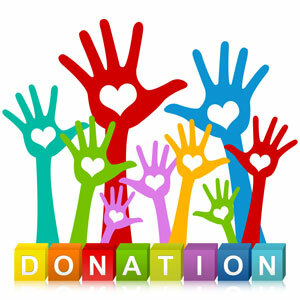 To encourage health services seeking behavior among persons with developmental disability. All persons with developmental disabilities will be eligible and included and there will be no 'selection'. 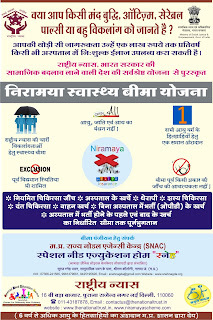 Reimbursement of claims in case of OPD services from any Qualified Medical Practitioner and for IPD treatment can be taken from a Hospital anywhere in the country. 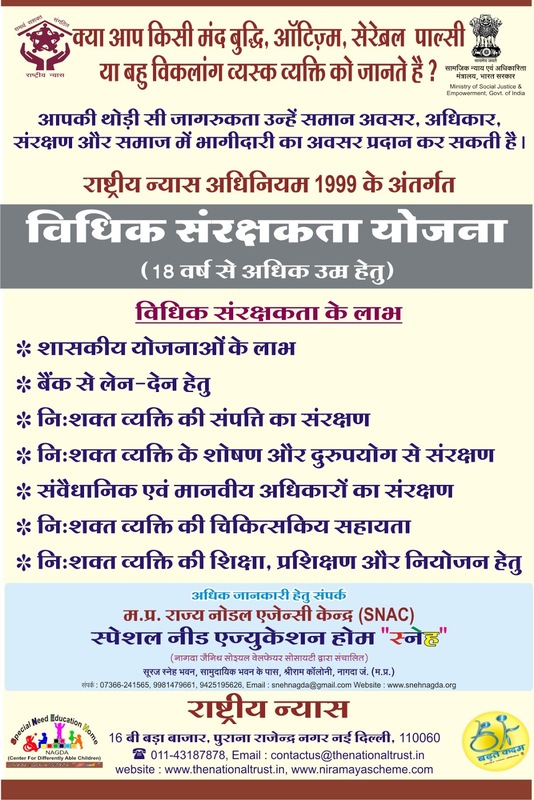 Any eligible person can apply for enrollment under the Scheme in the prescribed format given on the website and submit it to the nearest organization registered with the National Trust or to any other agencies specially entrusted in this regard by the National Trust. On successful enrollment and approval, Health ID No. / card will be issued to each beneficiary and then can print Ecard through the website. Fresh enrollment may be done throughout the year through our registered organizations. Both the fresh enrollment and renewal will be from the enrollment date with the Insurance Company to the end of the financial year. Any beneficiary enrolled during any month of the financial year will be covered upto 31st March. The enrollment / renewal fee will be full and will be eligible to claim upto Rs.1 lakh. The entire scheme may be implemented & monitored by the National Trust through registered organization (RO) with the active participation of the Local Level Committees (LLC). 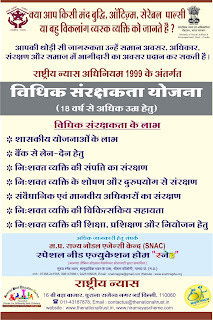 The registered organization (RO) shall liaise with the Insurance Company, health service providers, LLCs, State Nodal Agency Centres (SNAC) of the National Trust, State Govt. and all the stakeholders concerned for awareness generation, enrollment as well as for the speedy settlement of claims.